For those reading this review, I will point out that I have all of the expansions installed and some of what I describe might not apply to their game. I may be referring to some of them during this article and will be using common abbreviations (LL/LIU, HP, HD). I will be referring to this expansion with the initials SV as the recent poll said was the preferred abbreviation (I prefer V/OH myself). I was just getting used to the new interactions and the new possibilities of building shops and restaurants when true to form, only a couple of months after an expansion has been released for "The Sims", Maxis announce the next one. With the new "call cab" interaction with only one option, it was predicted it would be another "out of neighbourhood" expansion. The Rumour Mill had speculated that it would be about sending your Sims to work, but there was a demand to include something that involved children. The supply met the demand. "The Sims" would be going on vacation. As I am addicted to "The Sims", I pre-ordered it from Amazon.co.uk. 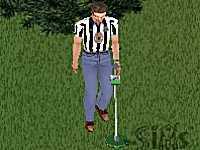 By the time it arrived, I had been expecting to have been in Hawaii playing 18-holes with Mortimer Goth, courtesy of "Sid Meier's SimGolf". Well, that's the difference between Firaxis & Maxis. Only two weeks after the American release, Maxis had delivered the goods and the expected package from Amazon landed on my doormat on the morning of the UK Release. Maxis, in their infinite wisdom, had changed the name of the UK version to "On Holiday", although I wonder why. The term "vacation" is used in the game and we all know what one is. It was now time to let my Sims, who were tired from holding house parties and living large with their hot dates, to take their children, who kept getting Â§100 from grandpa for good grades, on a well-earned vacation. The game comes in an easily-portable DVD-style box, as almost all games over here are. I could say something about this style of packaging reducing the depletion of rainforests, but won't. The small manual recommends the hard drive be scandisked and defragged. For those with a large hard drive, it is probably better to do this the night before expecting a delivery. 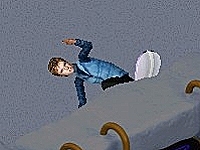 Keep your other Sims disks handy. I only needed to use my HD disk but for those that, the other expansion disks might be necessary. I had no difficulty installing it and once that was done, HD went on the shelf. The introductory AVI has gone. At this point, I usually comment on the fact that it had not changed with successive expansions. 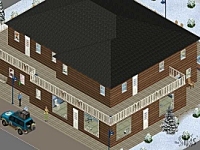 It might have been Maxis's move to stop me moaning on about gable-end roofs being missing from the game ("they're in the introductory AVI so why aren't they in the game? "), although I doubt it. This time it is not here at all. With HD, the loading screen changed from the familiar Sim-blue to a blood red. With SV, it is now a sandy yellow. The loading time is notably slower. On a minimal installation with no user-made downloads and mainly uninhabited neighborhoods, it almost doubles the time. For those with eight full neighborhoods and a lot of downloads, you will have time to put the kettle on and make yourself a mug of coffee. You will have time to drink it later. The comments running along the bottom have changed to topical phrases like "Calculating Exchange Rate" and "Hiring Entertainment Talent", although "Still Reticulating Splines" is familiar to us all. For anybody using a lot of expansions, 64Mb of RAM is not enough. Even 128Mb of RAM does not seem to be enough in my case. The more the better. But less of the technical blurb, what about the game? Similar to the icon that was added to the top of the screen when HD was installed allowing you to edit downtown, another icon is added to the top of the screen for when you want to edit your Vacation Island. Although I was itching to send my Sims on holiday straightway, I chose to look at what was going on at home. For those who made themselves a mug of coffee, here's your chance to drink it. When I clicked on one of my lots, the game creates the other tourists that you will meet when going on vacation. This is similar to what was done with filling Downtown. Apart from the new NPCs (more about them later), it generates random tourists who are made up from what is in your skins folder. The larger your skins folder, the longer this will take. If you have a lot of neighborhoods, you might be drinking a lot of coffee as there is a Vacation Island for each lot. More about that later. Fortunately, it only does it once per neighbourhood... I hope. Once your lot is opened, you are immediately told about Vacation Island Tours being only a phonecall away. HD owners are already familiar with the short & longterm relationship bars replacing the old single bar and new interactions that came with it. These allow even the best of friends to row and the worst of enemies to have a relatively civil meeting, not to mention the more advanced interactions dealing with dating. These have been included with SV, but it has been enhanced to allow more interactions for children, who have had a boring existance lately. With every expansion, there are new objects, walls & floors included. There are no new roofs. HD has been the only expansion to date to add them, leaving the task of roof creation down to the players and site staffers. Another thing that has not changed is the old 80-file limit for windows, doors, stairs & fireplaces. 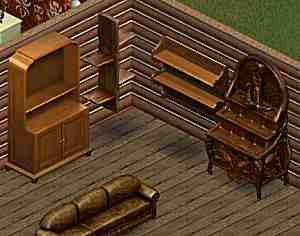 All user-created windows, doors, staircases & fireplaces should be converted into Buy Mode objects using a program like Paladin's "The Sim Categorizer". This is causing a lot of frustration in the community as categorising should not be necessary. Maxis changed the limit on walls, floors & objects with LL/LIU - thank goodness. However, I would have thought by now they could have changed this bit. Like HD, there are objects that only appear on the island and objects that only appear in the neighborhood. 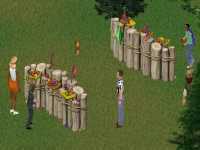 In addition, there also objects that only appear on the island and downtown and some objects that appear in all three. The unique objects for the neighborhood are the souvenir displays. These serve the purpose of storing and displaying the souvenirs that you buy or pick up from your vacation. There are five of them including a fireplace with a mantelpiece to display them on. Souvenirs can be shown off to guests or other family members. The more souvenirs you collect, the better the bonus to your room rating. In my opinion, the best of the new objects is the AquaFluvium Showertub. This takes up the same size as a bath and allows you to either have a shower or a bath and is actually more realistic. After all, how many people have both a bath and a separate shower cubicle in the same bathroom? For Sims with a small bathroom, this is ideal. In the Build Mode, there are new staircases, fireplaces, windows and walls that you can add to your house and Vacation Island resort. Okay, so you now know some of the benefits for the householder with SV. It is about time we booked ourselves a vacation. 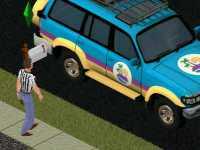 If your Sims do not have a telephone, they will never get there. The "Call Cab" Option from your telephone first appeared with HD. There is now the option to call a cab to take you on vacation. It costs Â§500 and might appear to be rather steep but this is the same for someone going on his own or a family of eight. Another way to go on your vacation is to call a friend and invite them to go vacation with you. You have about half an hour before a blue SUV from Vacation Island Tours arrives outside your door and whisks your household off on vacation. A picture - similar to the neighborhood map and that of Downtown for those who have HD - appears and asks you which resort you wish to go to. There are only nine instead of the familiar ten, but these are enough. They are equally divided between the beach, woodland and alpine regions of the island. Three of the finalists from "Sim Brother" were given tours as part of their prize. Anne Robinson was given a vacation at the Alpine Escape Ski Lodge. 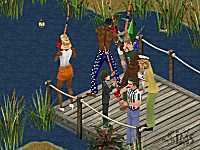 Tony Blair - the series runner up - was given a vacation at the Lakeside Hotel in the woodland area of the Island. Anna Kournikova - the series winner - was given a vacation at the Melrose Hotel on Golly Beach. They each report about their vacation and look in detail and their part of the island. I was quite pleased to find I was going on holiday and that I would be staying at the Alpine Escape Lodge. The first thing I noticed was the indoor swimming pool and I couldn't resist trying the slide. Piped in music made the experience even more pleasant. Strangely, even Kana the Vacations Director and 'Betty the Yeti', the children's entertainer enjoyed swimming ... their uniform and costume must be waterproof. After my swim, I signed in at the hotel. If I didn't do this, I would not be able to get into my room. The hotel had two twin rooms and one double room. Therefore, if all of the Sim Brother housemates had come here, some of them would have nowhere to sleep. There was only one shower for all the guests, but fortunately I was the only guest staying at the hotel. After a quiet night watching TV and a good night's sleep in my spacious room, I decided to see one of the other resorts in this area. There were several conveniently located telephones and I ordered the courtesy shuttle from one of those. While I waited for the courtesy shuttle, another one pulled up and unloaded a family at the lodge. The Penguin Acres Campground allowed the guests to stay in igloos. However, I had not signed out from the Alpine Escape Lodge. I decided to make the most of the amenities. The Campground Shop had a souvenir stall, postcards and sold winter clothing. I decided to buy a Unicorn to give to Jerry when I got home. The shop also sold postcards and I bought one, filled it in and immediately sent it to Jerry from the conveniently situated mailbox. There was a hotdog cart that helped give me something to eat before I decided to try out the other amenities, mainly being the fairground. There were many different games, including a shooting game, a traditional "Test Your Strength" machine and a chicken toss game. For this one, I had an adversary in the form of the talkative Daniel Gibson who was here with his family. My vacation was coming to an end the next day. Before I booked a shuttle to take me back to the lodge, I braved the halfpipe and tried out some snowboarding. I'd recommend it to anyone ... if they are brave enough. Vacation Island Tours were very kind to pick me up from my door. I thought this was special treatment, but the driver told me that they did this to all of their customers. I suppose it was reasonable considering other tourists would have to pay Â§500 to go to Vacation Island. The Lakeside Lodge Hotel was an attractive building in woodland surroundings on the shore of Lake Simdermere. I was greeted by a lady who introduced herself as Kana and that she was the Vacation Director. She said she could answer any questions I may have on anything from touring the island to parental discipline. Like all tourists to the hotel and other lodges on the island, I signed in the registration book. The tariff for all of the other guests was Â§40 per person per night so a family of eight would have to pay Â§320. This would be quite expensive if they were staying for a week. The hotel staff were efficient but you couldn't talk to them. The Janitor named Tanya did appear to be an improvement over the Janitor downtown. I wonder if she'd consider swapping. The Rental Shack was found next to the archery range. I could have chosen to hire a volleyball or practice my archery. As it was, I chose to hire a metal detector. This would have cost me Â§60. I had heard someone had found a valuable llama statuette a few days earlier. I was hoping to be as lucky. If not, getting the odd simoleon would be good enough. However, I was also to strike lucky after a day's work and unearthed a blue crystal. All that walking around had made me very hungry and I went into the hotel's dining room. Catering was by way of a self-service buffet. Archie Archer, one of the entertainers found around the resort, told me that dinner cost Â§25 per portion. The portions were generous. There was a family eating in the dining room, but at 9:30pm, I was the only guest in the hotel. I presumed they were staying somewhere else and used the hotel's facilities. After I had finished my meal, I went to bed. I had a shower in the ensuite bath and shower combination which made the most of limited space and made a note to buy one when I get home. Marrion the Maid came in to clean the bathroom only minutes after I had been in bed. Although I admire efficiency, I was puzzled as to why they didn't wait for people to have got up and gone out for the day? Anyway, I slept well and had a long morning soak in the ensuite hot tub. I decided to spend the day at one of the other resorts near the hotel and took the SUV to the Ranger's Ranch Campground, where people who wanted to rough it stayed. The facilities were rather primitive but the people who were staying here seemed to be enjoying themselves. One of the families were having fun throwing water balloons at each other. Even though there was a perfectly good lake back at the hotel, I decided that I was going to fish in the small pond at this campsite. The rod cost Â§45 to hire from the rental shack. Although I wasn't particularly good - or lucky - it was a good opportunity to meet the Orwell family. All good things must come to an end and the following day, I was to go back home. Although I enjoyed the facilities and being in the great outdoors, I would have enjoyed it even more if I had been with a friend. I did not want to go alone so before I went on my holiday, I persuaded Will Wright to let me take Tony with me. We arrived at the Melrose Hotel on Golly Beach which was the latest in a long line of developments from the Maxis Travel Company. I looked around the hotel's boutique for a new swimsuit as Tony signed us in. Tony was trying out the carnival games when I found him but our attention was caught by the volleyball court. From our last week in the Sim Brother house, we were keen to see who would win this time. Once again, I did. Sorry, Tony. 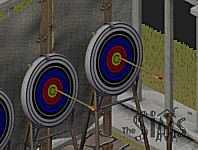 Our competitive nature continued when we tried the archery ranges. This time, it was too close to call. I thought I won. Tony thought he won. You can be the judge of this. When we had our dinner in the self-service dining room, Tony was in a sulk and sat separately. Nevertheless, we made up later and I was pleased to notice that this vacation appeared to be doing our relationship a lot of good. 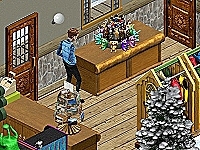 However, I would have rather the camera surveillance was not as intrusive as it had been on Sim Brother. Can't a couple have any privacy? We slept well and the following morning, we continued with our friendly sparring on the "Whack A Will" machine. Apparently, the noises it makes are actually the voice of WW. 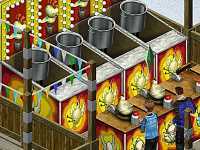 Following that, our contest extended to the arcade machines. Although we enjoyed being pampered, I decided to check out and stay at one of the neighboring resorts in this area. I chose for us to stay at the nearby Sunset Beach. Kana was busy doing her duties as a walking almanac and Marky Sharkey was irritating the children. I beat Tony again at volleyball but I made it up to him on the evening in the tent that we shared. For the last day, we played on the carnival sideshows and finished with a picnic. When we arrived back home, we both had our prizes from the carnival. In this case, Tony's was better than mine. Well, he had to win something. However, I really enjoyed my holiday and it was made all the better for having someone with me. There are some new resorts opening soon. I'd like to go back again. Next time, I might get to build the sandcastle that I wanted to. Which Sims will I meet on my vacation? Unlike HD, you will not meet anyone from your neighbourhood. Unfortunately, like HD, neither will you meet any Sims from your other neighbourhoods. I think Maxis are holding things like that back to put in TSO. Similar to HD's Townies who are different in each neighbourhood, you meet different families of holidaymakers that strangely enough seem to all have surnames of writers. The Twain & Sagan families come to mind. Can I save the game while I am on vacation? Unlike HD, yes you can. When you reopen your neighborhood, you will find a small Vacation Island icon over the house of your vacationers. Unfortunately, if you want to send some other lot on vacation, they cannot go to the resort that the first family are at. Does it have gable-end roofs? Yes. SV gives me the impression that it has been rushed. HD missed out the Old Prude, SV has missed out the pickpocket. HD missed out the bay window, SV has missed out the putting green. Although many of the objects are described in the usual light-hearted manner, they did not finish the job. There are quite a few that are incomplete, for example"*Awning-Vacation-Â§240" that you can see on the right. The cheery descriptions tend to aid in that suspension of reality but when you see nondescriptions like these, the spell is broken. If it takes them as long to come up with a patch for the game as it did with HD, I will expect to have these problems fixed with EP5 in four months time ... but by then, I will be complaining about the errors in that expansion. Does SV also serve as a patch for HD? For people who have HD, you will notice the Old Prude when you go downtown. In build mode, you will also notice bay windows. Also, people do not seem to get stuck as much. All of these should have been fixed by now instead of having to wait for the next expansion. How many marks out of ten would you give it? Is it worth going on vacation with The Sims? Maxis spoiled us with the "Hot Date" expansion pack for Downtown, Interaction Rewrite & Objects. That has set the benchmark and although it is very close, Vacation does not reach it. However, comparing it to the earlier benchmarks of "Living It Up" or "House Party", it offers a lot more. Is there anything new for it yet? There are already two new download objects that can be found at the official website, plus the Vacation Exchange has been set up for different resorts. Also, the community has got down to posting new resorts on their own sites - TSZ is no exception as at least two new resorts will be added to our database shortly - and editing the different objects and these can be found on the different sites, and shortly on this site. It's worth buying it for the change of scenery alone. Combined with the other expansions, it makes the whole Sims experience a lot richer and I am looking forward to EP5. Written at 21:00 on Wednesday 15 May 2002 by Andy.